Swaziland, which is ruled by a dictator-king refuses to legally recognize the country's only labour federation, the Trade Union Congress of Swaziland (TUCOSWA). 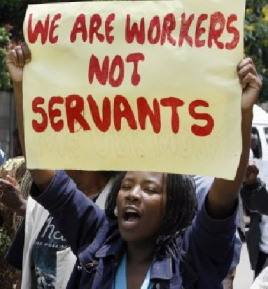 The global union federation Public Services International (PSI) has started an online campaign in support of TUCOSWA here. A RadioLabour report on the situation in Swaziland featuring Mduduzi Gina, the 1st Deputy Secretarty-General of TUCOSWA.